Need the flexibility and control to manage large-scale deployments? Private colocation suites are available in the Montreal market. Interested in more information or a tour of our MONTREAL data centers? Our Montreal data centers feature sustainable, green design with state-of-the-art cooling and electricity that’s 100 percent generated from renewable sources. Equipped with Performance IP and connecting seamlessly to other major North American cities through our backbone, Montreal data centers are the ideal Canadian foothold for your business. 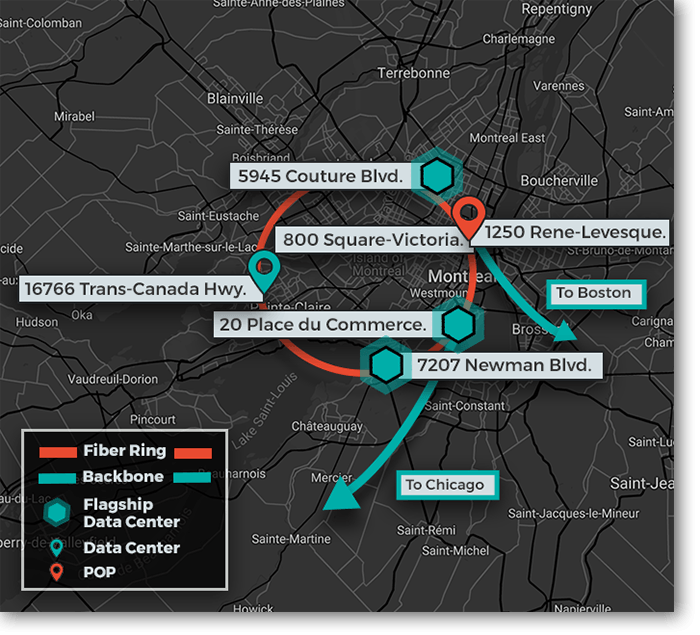 Our Montreal data centers connect to Boston and Chicago via our reliable, high-performing backbone.